This tutorial will show you how to add Emojis (also known as emoticons) to your Instagram photos (and any other App/service that utilizes them). To be a bit more accurate, this tutorial will show you how to enable the Emoji “keyboard” on your iPhone – and show you how to use it. So in addition to being able to use Emojis with Instagram, you’ll be able to use them on Twitter, messaging Apps, on Facebook etc. All of this using software that’s included on your iPhone. Start out by tapping the Settings button on your iPhone. Select General. Scroll down to Keyboard and select it. Scroll down to Keyboards – which will probably have a 1 next to it (unless you already use multiple keyboards) – and select it. Scroll down to Emoji and tap it. You’ll be returned to the Keyboards screen. This time you’ll see at least two ‘languages’ listed. Tap the Keyboard button in the upper-left corner of the screen. Make sure that there are now at least 2 Keyboards and then leave/close the Settings section. Now to use Emojis! 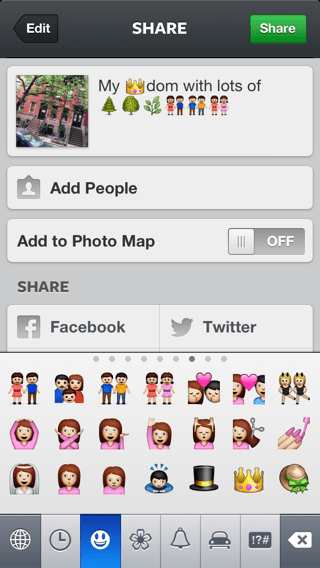 Compose a TXT/SMS, go to Facebook or as the title of this tutorial suggests – open Instagram. Compose a message as you normally would. When you’re ready to insert Emojis – tap the new “globe” icon (button) on your keyboard. This will switch you from the English (or whatever language you normally use) keyboard to the “Emoji” Keyboard. As illustrated in the example image below, there are a lot to choose from. The bottom ‘toolbar’ has a series of buttons that ‘group’ certain types of Emojis into categories. Each category is ‘swipeable’ – swipe from side to side to bring up the multiple screens of Emojis. Now tap one. As you can see in the example screenshot below – I tapped the “crown” Emoji, and now it’s a part of my Instagram message. To switch back to your normal keyboard, just tap the Globe icon/key again. Once you’ve finished composing your emoji-infused message, publish it as normal. My emojis come out looking like Chinese symbols…?